Photographed on the Thursday 20 August 2015. 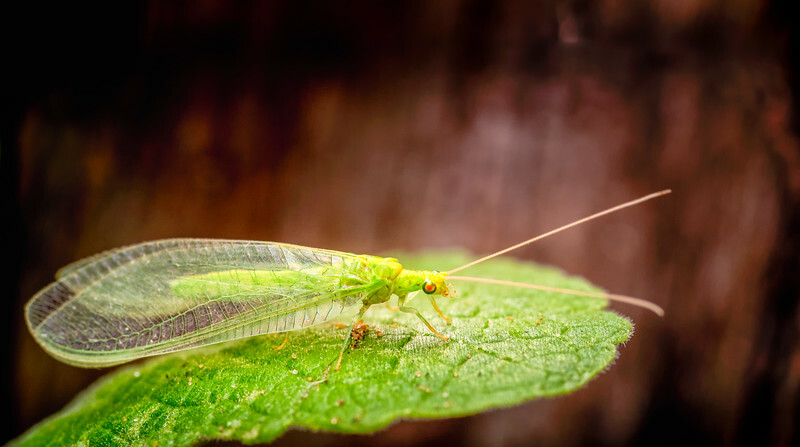 Lacewings are common insects in British gardens and are easy to recognise by their transparent lace-like wings, which are nearly twice as long as the abdomen. They belong to the Order Neuroptera (net-winged insects). Lacewing larvae are voracious consumers of aphids and insect eggs. There are several British lacewing species, which are often divided by colour, into green (14 species) or brown (29 species) forms. The giant lacewing (Osymlus fulvicephalus), with a wingspan of up to 5 cm, is often found near streams and rivers. They are fairly slow moving and would make a ready meal for a foraging bird, so are rarely seen flying during the day. Instead of feeding on aphids, the larvae of the giant lacewing are semi-aquatic, and feed on the larvae of midges and other small species. Lacewings can be encouraged to remain in your garden by providing homes for their winter hibernation, which can be bought from some garden centres. They will be ready to lay eggs and help to control your aphids when they emerge from hibernation in the spring.